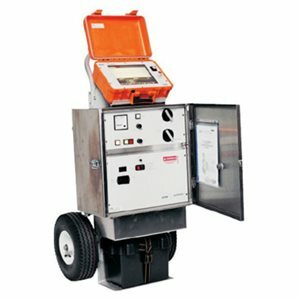 For customers who need more power and functionality with fault locating, Megger offers the Surgeflex25-1150 M. These systems are designed for the more frequent and experienced users. They offer the benefits of fully-functional radar with the additional power needed to fault locate on any type of distribution system. Surgeflex25 offers 25 kV at 1150 joules and can locate faults on any URD system. These units feature ARM filters, a switchable capacitor that allows full energy output at any voltage and a new, 10.5-inch color automatic radar screen. They’re the smart choice for the experienced locator.